Let’s be honest: when it comes to Wes Anderson’s soon-to-be-seminal classic The Grand Budapest Hotel, there certainly are not only ten looks to categorize as fashion gold. However, any true fan knows that Mr. Anderson loves his symmetry, and the number ten was the most symmetrical number we could think of (we’re fashionistas, not mathematicians). What Anderson created (along with writer Hugo Guinness) in his visionary world was pure magic. The story is set in the fictional Eastern European Republic of Zubrowka during a World War II-like era. Academy Award-winning costume designer, Milena Canonero, was undaunted by working with Anderson – in fact, she was more than up for the challenge, and decided on a “holistic approach” after several conceptual meetings with the director. What resulted was a visual cacophony of color that shouldn’t have worked very well, but did. Now, The Grand Budapest Hotel is neck-in-neck with Birdman, both films leading the Oscar 2015 race with 9 nominations each. And of course, Milena Canonero is nominated for “Best Costume Design” for The Grand Budapest Hotel. 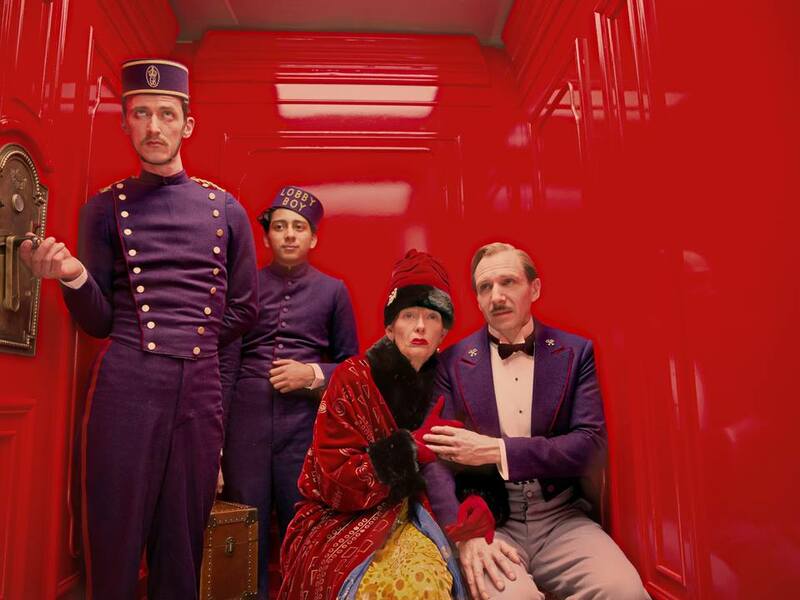 The iconic uniforms of the once-grand Grand Budapest Hotel were a deep, penetrating purple. Zero’s outfit, in particular, was topped with a combination pillbox/Shriner hat with gold thread reading, “LOBBY BOY.” Zero’s costume lacked the gold buttons or even the epaulets of say, the elevator operator, and it’s certainly not up to par with Ralph Fiennes’s character, M. Gustave, who dons the symbolic Society of the Crossed Keys pins. However, it is resplendent, with Canonero stating that it added a beautiful touch to what otherwise would have been a dull addition to the cast’s wardrobe. Murray didn’t have the most flamboyant of costumes, but his handlebar mustache more than made up for that. Outfitted in the beige version of M. Gustave’s uniform, Murray looked like what we’ve always dreamed having an English grandfather would be like. And did anyone else notice that all the good guys wore bow ties? Norton definitely got to have more fun than Murray with his attire. He donned a Nazi-esque uniform (hear us out) that had a trim fit and a silver fox medallion accessory in lieu of a tie (perhaps a nod to Anderson’s Fantastic Mr. Fox?). He also wore a combination shearling/boucle knit coat. And that’s really where the fun ends with Norton’s character. What can we say – we love Brody’s money-hungry villain Dimitri, especially in that all-black goth ensemble. Maybe it’s our dark teenage years, full of ennui rising to the surface, but we’re into it. And notice – he’s wearing a tie! The Devil Wears Prada indeed. Dafoe rocked a Prada leather trench coat that was central to his character’s makeup. When we saw that coat appear in Grand Budapest (and sometimes, that was our only indication that Jopling was around), we knew something sinister was afoot. Okay, we had to look up Clotilde to remember who she was, too, but who doesn’t love a good French maid uniform? Seydoux is the embodiment of a fantasy in her costume, which makes us want to run out and buy one in several colors. With Goldblum’s multicolored beard and bolero-like tie, he looked like the hipster version of Colonel Sanders – and we love it. Also, anyone that uses a cat as both a fashion accessory and beloved companion (hello, Karl Lagerfeld, we’re talking to you) is top-notch in our book. How darling is Saoirse Ronan in her blue knit scarf, classic trench, and penchant for pastels – particularly blue and pink? So darling is the answer that you’re looking for. Girl can make even a birthmark shaped like Mexico look good. 2.) Tilda Swinton as Madame D.
We were debating whether or not to let Tilda or Ralph be our #1 pick, but Fiennes’s out-of-this-world character interpretation coupled with M. Gustave’s phenomenal taste made it clear who the victor should be. We mentioned earlier that his suit was what everyone else’s look really revolved around – he was the trendsetter, the tastemaker – much like Anderson himself. One can only hope that the Academy will see it the way we do on February 22. Author BIO: Anna Jones is a bicoastal freelance copywriter, who enjoys mostly writing on fashion and beauty – though she’s written on nearly everything, from dehydration in children in Third World countries to why vinyl windows are a great addition to your home. She holds a Bachelor’s from Georgia Southern University, and enjoys traveling, cooking, and watching Netflix with her husband and cat. Anna is one of our blog contributors highlighting everything from current movies to PLIA Designs designer handbags.